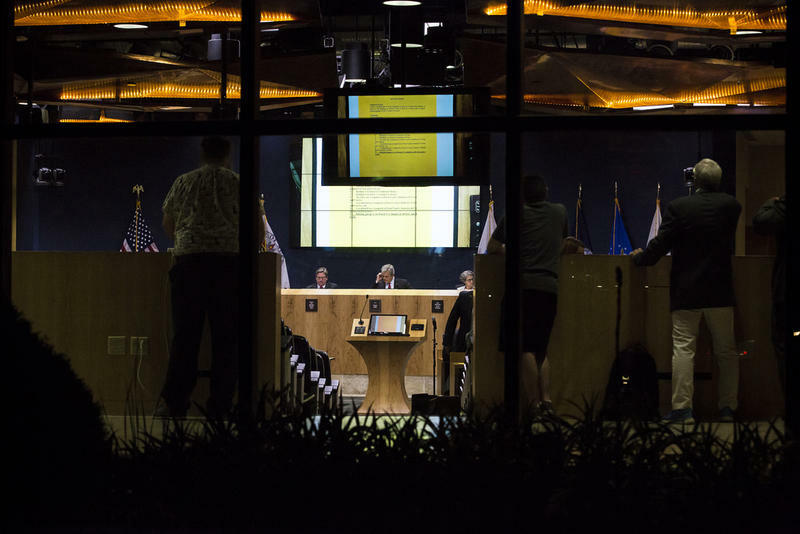 After hours of deliberation, the Austin City Council rejected a five-year contract between the Austin Police Department and the city last night. 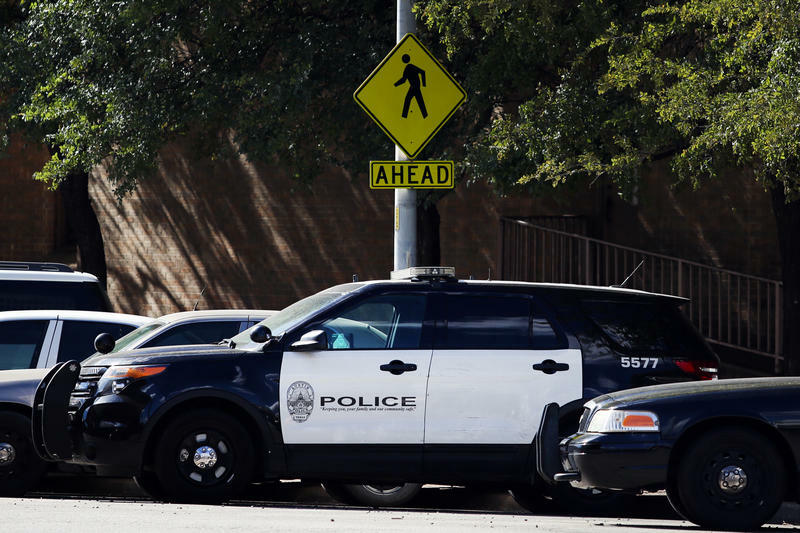 Austin City Council members voted unanimously to send a five-year contract between the city and the local police union back to the negotiating table late Wednesday. The decision came after more than 150 civil rights activists, police officers and residents testified for seven hours for and against the proposed contract, which dictates pay, discipline and oversight of officers. The contract is negotiated once every several years, and the city and the police union began negotiations back in May. The council has never rejected a proposed police contract in the two decades since it has had one, according to the city. 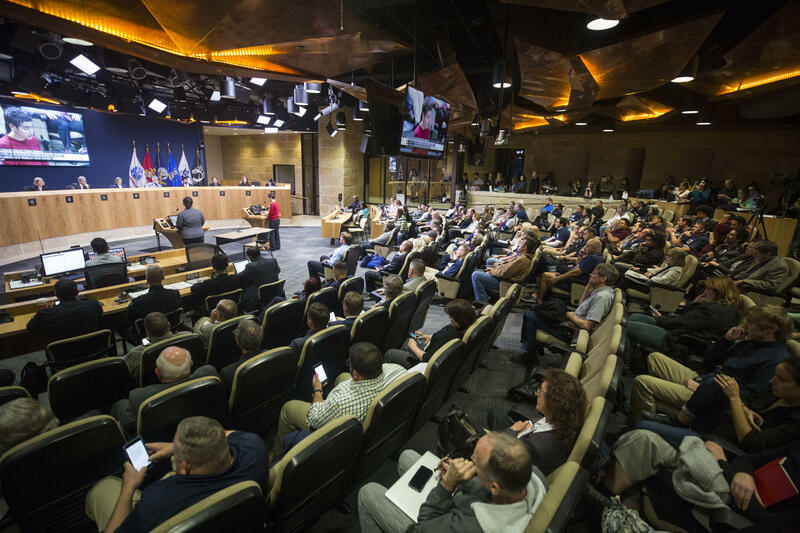 Before the vote, council members weighed increased accountability and transparency measures against a possible pay raise for officers over the next five years. Austin's police force is currently the highest paid in the state. Supporters of the proposed contract wore blue T-shirts that read, “Keep Austin Safe.” Others taped a large banner calling on council to reject the contract to the large windows at the back of council chambers, which people signed throughout the night. 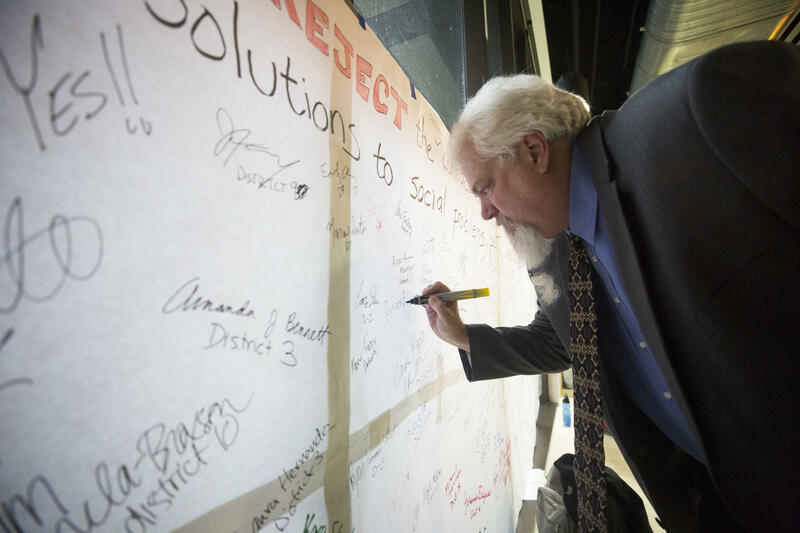 Richard Boland, with Peaceful Streets Project, signs a large banner in City Hall calling on council members to reject the police contract. Reggie James, director of the Lone Star Chapter of the Sierra Club, was among a majority of people who asked for increased transparency in the new contract. James said he was a family friend of Morgan Rankins, who was shot earlier this year by APD officers. 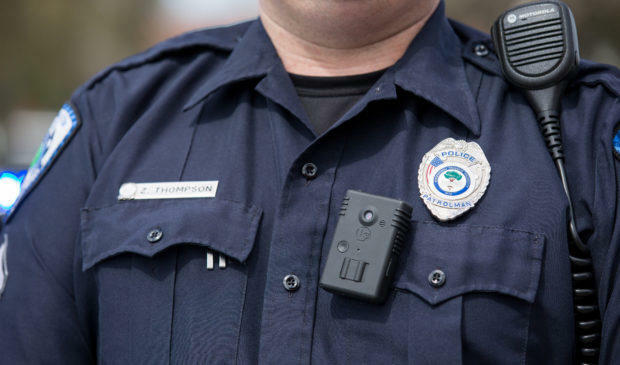 Activists called for additional oversight measures in the contract, including giving independent bodies, like the Officer of the Police Monitor, the power to investigate officers. Currently, that power is granted only to APD Internal Affairs. The cities of San Francisco and Chicago have independent bodies that have investigatory power. Roughly a dozen current officers testified in support of the contract – many saying to reject it meant risking a return to policing without a contract. If the city goes with a contract, its police force functions under a civil service agreement as set out by state law. Representatives for APD cited several changes that they felt satisfied the demand for more accountability, one of which would have allowed citizens to file complaints against police online and anonymously. Currently, a person has to make a complaint in person and sign an affidavit. The proposed contract would have created a 9.5 percent pay increase for officers over the next five years. 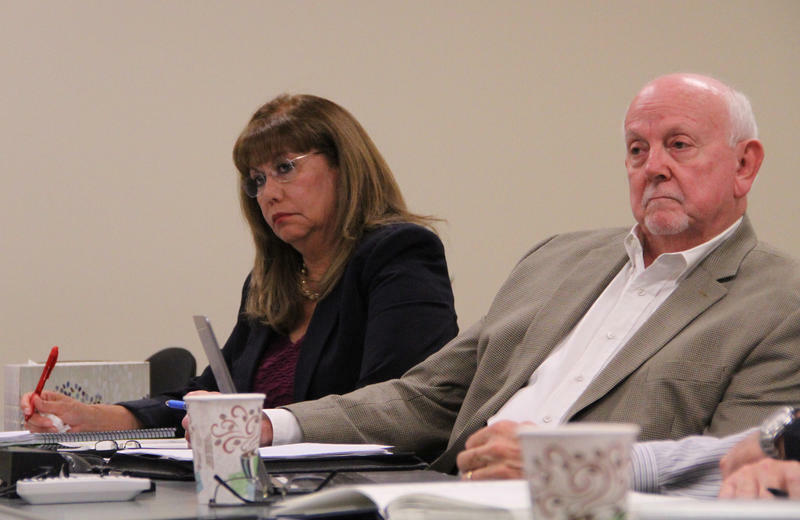 According to Larry Watts, the city’s labor relations officer, the increase would have actually brought the department closer in line with pay at departments across the state – from 13.6 percent above the next highest base pay rate to 10.7 percent above. Council members asked that a new contract come back for a vote before March 22. The current contract expires at the end of December, but there is still the option to renew it. Interim Police Monitor Deven Desai opened negotiations between the city and police last week with a nod to a crowd of activists gathered in one corner of the room. The Austin Police Department is taking its fleet of more than 400 Ford Explorers out of service amid concerns of carbon monoxide leaking into the cabins. Austin Is Trying Hard To Keep Its City Manager Search Secret. That May Be Illegal. Austin City Council members have been meeting this week with candidates to be Austin’s next city manager — which is among the most powerful positions at City Hall. But the city's gone to great lengths to keep this selection process secret. It's declined to name the candidates, and council members appear to have gone to great lengths to conceal their identities.